n 1997, four years before the initial release of Google Earth’s predecessor Earthviewer, the Florida Research Ensemble (FRE) began work on “Imaging Place,” a place-based virtual reality project that combines panoramic still photography and video, with three-dimensional virtual reality to document situations where the forces of globalization are impacting the lives of individuals in local communities. We continue to work on this project in various forms to this day. Screen recording excerpt from “Imaging Place: The Miami River,” by John Craig Freeman with theory by Gregory L. Ulmer, interactive virtual reality installation, 1997 – 2007. The goal of the “Imaging Place,” project is to develop the technologies, the methodology and the content for truly immersive and navigable narrative, based in real places around the world. It includes hundreds of individual locations and hours of content from Cape Verde, Beijing, Taipei, São Paulo, Kamloops British Columbia, Warsaw, the U.S./Mexico Border, Kaliningrad, Niagara, New England, Appalachia, Florida and more. “Imaging Place,” is inspired by the work of Guy Debord and the Situationist International, and their concept of psychogeography. Not long after its founding in Paris in 1957, the Situationist developed the idea of the dérive, a kind of open passage walk or drift. Participants were encouraged to ignore the normal traffic flows and circulations of planed urban developments and instead, moved through a city in a way that followed its moods. The goal was to track the cities emotions —the feeling and atmosphere of a place, to find what they called the plateau tourné. A plateau tourné is a turntable or hub —a vortex or center of power, where forces come together to create strong atmosphere. 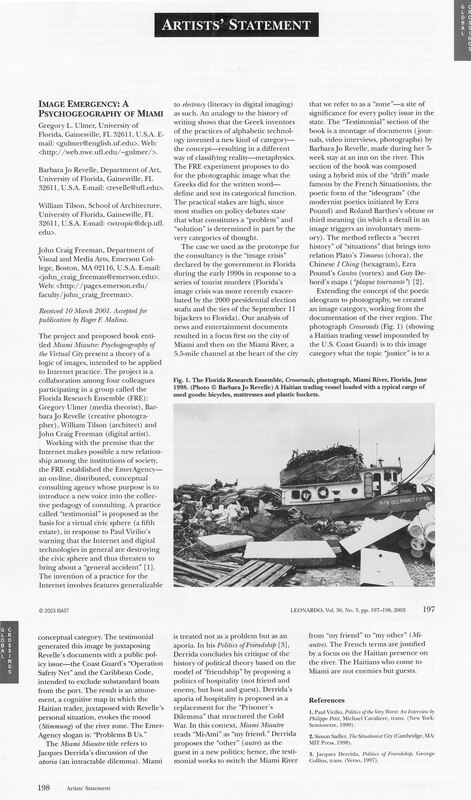 You can read more about how “Imaging Place” relates to psychogeography in Maayan Glaser-Koren’s paper “Drifting and Imaging Beijing” which was delivered at the 2011 International Symposium on Electronic Art (ISEA) in Istanbul. For more on “Imaging Place,” please see “Imaging Place: The Choragraphic Method” Rhizomes Vol. 18, “Place and the Electrate Situation Rhizomes, Vol. 13, and “Psychogeography of Miami Leonardo, Vol. 36, No. 3, pp. 197 – 198.